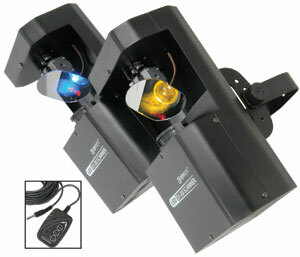 This scanner kit is everything you need to start equipping your lighting rig with the latest LED technology. The 2 x DJ-20 scanners come complete with a hand controller for easy operation. Both scanners are impressive with their high power 20W LED output (each) and a choice 8 selectable colours and 8 gobos (+ spot). This is a great product that is ready to use with no bulb replacement and low power consumption. Includes hand controller for easy operation.